Wing span: 2 1/4 - 4 inches (5.7 - 10.1 cm). Identification: These two very different forms had once been considered separate species. WHITE ADMIRAL: Upperside is black with broad white median bands on both wings; hindwing has a marginal row of blue dashes and a submarginal row of red dots. Underside is reddish-brown with white median bands as on the upperside. RED-SPOTTED PURPLE: Upperside is blue to blue-green with much iridescence on the outer part of the hindwing. Underside is dark brown. Forewing has 2 red-orange bars near the base of the leading edge; hindwing has 3 red-orange spots near the base and a submarginal row of red-orange spots. The two forms hybridize where their ranges overlap, creating various intermediate forms which may be found in or near the overlap zone. Life history: Males perch 3 feet or more above the ground on trees and tall bushes and rarely patrol for females. Eggs are laid singly on tips of host plant leaves; caterpillars eat leaves. Third-stage caterpillars hibernate. Flight: Two broods from April-October. Caterpillar hosts: Leaves of many species of trees and shrubs including wild cherry (Prunus), aspen, poplar, cottonwood (Populus), oaks (Quercus), hawthorn (Crataegus), deerberry (Vaccinium stamineum), birch (Betula), willows (Salix), basswood (Tilia), and shadbush (Amelanchier). Adult food: Sap flows, rotting fruit, carrion, dung, and occasionally nectar from small white flowers including spiraea, privet, and viburnum. White Admirals also sip aphid honeydew. Habitat: The White Admiral form is usually found in the north in deciduous broad-leaf or mixed evergreen forests dominated by aspen or birch. 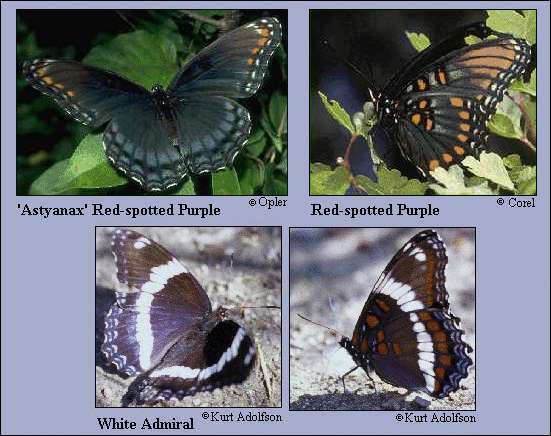 The Red-Spotted Purple form is usually found further south than the White Admiral, in deciduous or mixed forests, moist uplands, valley bottoms, and coastal plains. Range: Alaska and subarctic Canada southeast of the Rocky Mountains to central Texas; east to New England and central Florida. Isolated populations in Arizona, New Mexico, and west Texas south into Mexico. The White Admiral form usually occurs north of a line through north central New England, New York, Pennsylvania, Michigan, and Minnesota. The Red-spotted Purple form is usually found south of this line. Much hybridization occurs where these forms meet. Comments: The Red-spotted Purple is a mimic of the poisonous Pipevine Swallowtail (Battus philenor). Boston, Mass. 370 pages, 23 color 	plates.